It was true on the French Mediterranean at the just-wrapped Semaine Olympique Française, or true enough to be said. But the final round of match racing had its own problems with light air (Tulloch, whose crew was plagued by a plague, did not make the final four). US Sailing Team AlphaGraphics’ (USSTAG) Anna Tunnicliffe (Plantation, Fla.), Molly Vandemoer (Redwood City, Calif.) and Debbie Capozzi (Bayport, N.Y.) won a silver medal in the Women’s Match Racing event at the 42nd French Sailing Week today, after finishing 1-3 in the final series against Germany’s Silke Hohlbrock. This was their second podium finish in the 2009-2010 International Sailing Federation (ISAF) Sailing World Cup series, after winning gold at US SAILING’s 2010 Rolex Miami OCR in January. Tunnicliffe’s team sailed strong and smart rounds throughout the week, but piecing together the puffs proved difficult in today’s first-to-three final series, and they found themselves on the wrong sides of the shifts more often than not. We’re talking winds of 1-4 knots, great weather for golf. 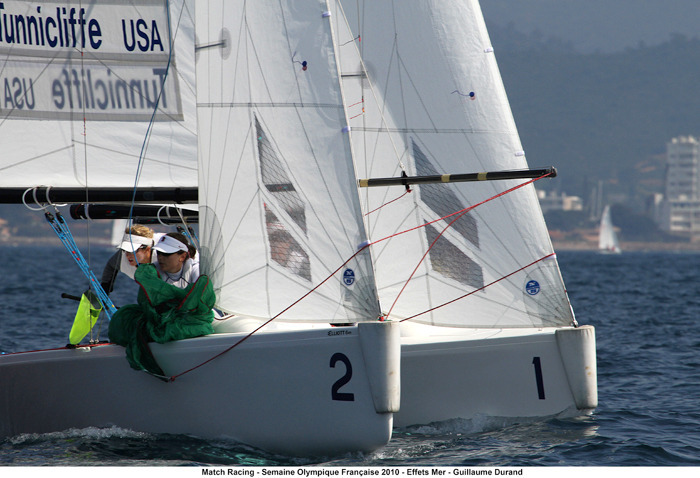 Two other USSTAG boats competed in today’s Medal Races: 2008 Olympians Amanda Clark (Shelter Harbor, N.Y.) and Sarah Chin (Hoboken, N.J.) finished eighth overall among 44 Women’s 470 boats, while Olympic Silver Medalist Zach Railey (Clearwater, Fla.) finished ninth in the 52-boat Finn class. ‘I just tried to make the best out of difficult and ever-changing conditions,’ said Railey. Complete results are listed at SOF.